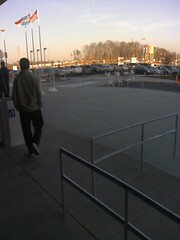 Ever since I knew about IKEA opening in Charlotte, I’ve been waiting… patiently, for the day to come. And I wasn’t the only one that went during the grand opening. Believe me, the place was packed. Traffic was backed over the bridge, although it flowed at a decent pace into the parking lot. 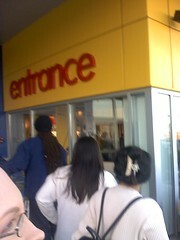 IKEA had hired ASIG security I believe to help control the flow of people. We actually got lucky and got directed into the empty spaces in the employee lot, so we were very close to the storefront. And if you don’t know how to get there, just take Highway 52 down and keep going until you get to exit 43. 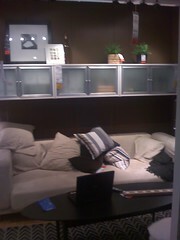 You can’t miss Ikea Blvd. It took us about fifty minutes or so to get there which was actually pretty great. Having been to the one in Seattle, I knew what to expect, but I have to say that it’s a blessing in disguise for those that like a little bit more modern looking furniture when you’re so close to the furniture capital of the world. And it’s cheap. Not in the materials, but in price. The packaging is absolutely great too since they try to pack in as much as possible as not to waste. It’s brilliant design. Any Black Belt would be proud to work here seeing how optimized towards business this place is from design of environment, to packaging, to even how the cafe is managed. It was all about flow of traffic. You’re pretty much guided through all of the show rooms by how it’s set up. Just like a herd of sheep. Not a bad thing, but bring your good walking shoes. It’s like going to Disneyland for Homewares. There are two floors. 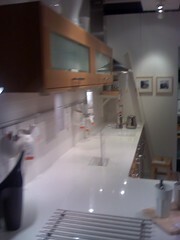 The second floor is mainly showroom areas where you can walk through and see different types of rooms and furnishings. It’s not everything for your home, but it’s pretty dang close. I bought a chest of drawers for $149USD since I didn’t have one. Any other packaging would have not fit in my trunk, but those actually did with no tie downs. Anywhere else, you’d be looking at easily $250-450 for the same (assembly took three hours with two people, but it was still worth it). Everything is pretty much hands on there in the showrooms. You can check out what you want, write it down, and pick it up at the self-serve furniture area later. What’s also great is that they have a couple complete furnished homes (European style, although it’d fit right in with say a NYC condo) where it was 270 sq ft, and 590 sq ft. The neat thing about this, is that it basically demonstrated that you could in small living spaces create a beautiful living quarters with the things they sold. And it was very functional and practical. There was a cafe there for the weary and tired, and the food was pretty good. But definitely not the highlight of the place although it was a wonderful value-add. The lower floors consisted of a daycare (that’s right, you can drop off your little ones), home goods, the self-serve furniture area, and checkout along with a bistro where you can buy drinks or Swedish foods and such to take home. Again, the flow of the area was what you had to pay attention to since it was extremely optimized towards guiding you throughout the entirety of the store, but it didn’t limit you in one single area. This particular store employs over 450+ employees and you could definitely tell that it needed every man and woman. I’ll definitely be coming back since there’s several bedroom and office items that I have to replace to fit my smaller room. But it goes to show that even in these economics, there are players out there that know when to capitalize. If you can provide decent goods for a great price, that’s where it’s a win-win situation between the consumer and the vendor. Well done, on the grand opening, IKEA. You had me captured in your store for at least four hours and I’ll be coming back to spend more time for sure.